To chore or not to chore, that is the question. When my children were little I would set up elaborate chore schedule in an effort to bring organization to our house. Even my husband and I were included on the chart to show the children that a clean house and a nice yard need many hands to make them happen. Chores do many good things for children. They help to develop a family community that assumes each person will work to serve the others. This translates easily to service outside the family and prevents the development of an attitude of entitlement while promoting good self-esteem. 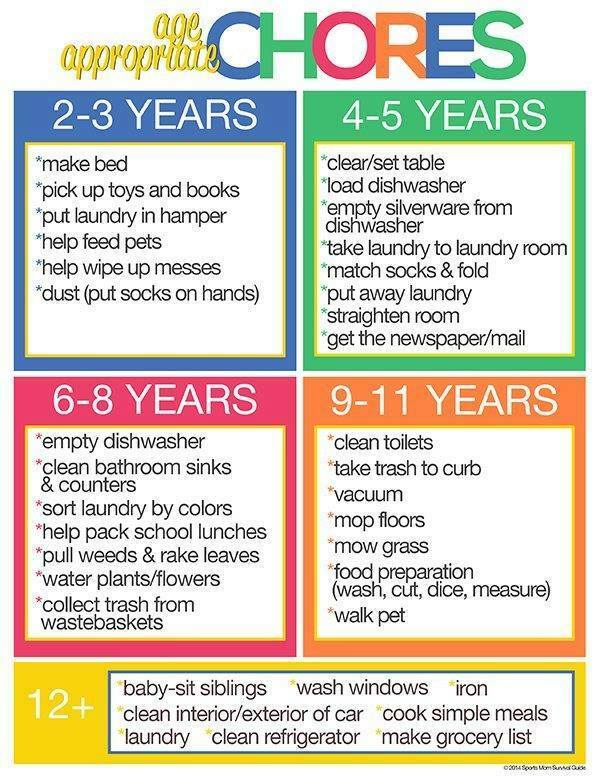 Chores also help children to develop self-regulation as they keep track of what needs to be done and what has been completed. My challenge with job charts was accountability. It quickly became easier to do the work myself. One mistake I made was waiting until my children were older to start them on chores. That is what I like about the chart above. Each age group has several job possibilities. Bless your children with a chore or two. Let them know they are an important part of the family.